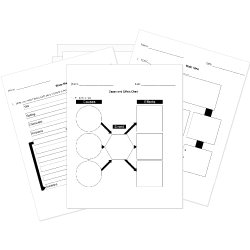 Looking for Study Skills worksheets? Check out our pre-made Study Skills worksheets! You can create printable tests and worksheets from these Study Skills and Strategies questions! Select one or more questions using the checkboxes above each question. Then click the add selected questions to a test button before moving to another page. A reference book containing an alphabetical list of words with information about them. Contains meanings of words, parts of speech, pronunciation. A reference book containing maps. A reference book containing words and their synonyms. Successful students usually sit and draw or doodle while the teacher is teaching a lesson because as long as they are quiet it is a good activity to do if you are bored. A group of reference books that contains information on all subjects or one that covers a certain subject thoroughly usually with articles arranged alphabetically. A reference book containing instructions, especially for operating a machine or learning a subject. A reference book containing a calendar and has facts about the rising and setting of the sun and moon, changes in the tides, and information of general interest for a particular year. When given an assignment, you as a student, are expected to do the assignment. If you don't want to do the assignment, which of the following should you do? Bother the teacher so much that he or she allows you to do whatever you want. Try your best and not disturb anyone. Ask to leave the classroom for any reason at all. Note taking can only be used when listening to someone talk. Drawing pictures can help you to understand vocabulary better. Use initials, abbreviations, and shortened words for note taking. Critical thinking is used to solve a problem. The keys to increasing your intelligence are avoiding challenges and giving up easily. When taking notes during a lecture, you should paraphrase what the teacher is saying.